Sifting flour was a process our grandmother’s used to do but is seldom called for now. Before the modern age of heavy machinery and higher government standards on food handling and preparation for the public, giant millstones were used to make flour bits of the stone would turn up in the flour along with other impurities that made their way into the mix. Flour would be sifted in order to remove all the little pieces that would certainly ruin breads, cakes and other recipes calling for the powdery substance. Now with increased regulations on food preparation by the Food and Drug Administration, large plants with state-of-the-art steel rollers make this process more sterile and unwanted impurities are less likely to make it into the flour. However, there are still times when sifting is necessary for a light and airy cake or nicely risen rolls. As flour sits on the shelf, it becomes settled. The air is removed as it waits for the moment it will become something bigger than just a bag of flour. Who wants to sit down and eat a bowl of flour? However, put a basket of steaming fresh rolls on the table and say no more! As flour is sifted air is distributed throughout the mixture. Flour is also sifted to incorporate ingredients that should be mixed together for the best results. By doing so, you introduce new qualities to the dry mixture surely to result in culinary success. Life is full of processes isn’t it? To think so much thought and attention goes into a common household item that is in many of the foods we eat, yet it is often taken for granted as we pour some out and dump it in a recipe. There is another form of sifting that Jesus spoke to Peter about the night that would begin the ultimate betrayal that would result in our Lord’s tragic death yet triumphant victory. It resembles the process by which flour is prepared and used, no wonder Jesus warned Peter that satan had requested to sift him like wheat. God gave Peter great potential. Jesus saw that purpose and added faith to it. The enemy saw Peter’s flaws and inconsistency. While trying to capitalize on his impurities, satan actually revealed these things to Peter as well. The night would be devastating for the man but his spirit would flourish in revelation. Within hours of leaving the Lord, Peter would deny Jesus Christ three times. The sifting process would begin. You cannot remove something that you cannot see. Finding something requires looking for it. If not aware of this process, often one will encounter failure after failure. Even the strongest, most dedicated follower of Jesus Christ has sin in their life. Consecration is the constant process of being sifted through prayer, fasting and deliverance of the impurities that are hindering the Spirit of God from fully activating in your life. Each round of “sifting” reveals the things that must be removed for purpose to rise. It becomes more vigorous as we eliminate the big things and have to search for the little hidden sins that have infiltrated our life. As God always, He is using what was meant for our harm for His Good! The enemy looks for new ways to disrupt your life, steal your joy and destroy your purpose, but God uses it to make us stronger especially in profound weakness. Are you being sifted today? Look for those things that are becoming evident in this process and allow the Lord to remove them from your life as your purpose begins to rise. Sifting will add the characteristics of God and mix His Power with your purpose. 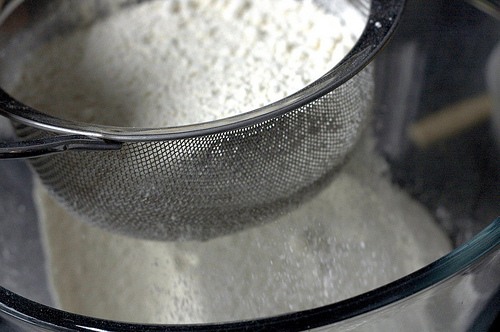 Sifting makes flour lighter. Air is added as the clumps of flour are broken down. Sifting a human soul adds God’s Spirit to every particle of your being. Your burdens become lighter as your yoke becomes His. Suddenly, success begins to overcome failures. Victory shines in the life of those who submit to the process of consecration and allows God to become a part of every aspect of their life. Finely distributing the qualities and characteristics of Jesus Christ throughout our daily existence empowers us to rise above the chains that bind us to the earth and live as a part of the Kingdom of God. It mixes all of who He is into what He has called us to be illuminating our Promise, binding Him to our Purpose and exposing our great potential. Sifting strains whatever has been submitted to the process. Do not hang on to what you think life was supposed to be like or who you thought you would be. It will not survive the process and the sooner you let it go, the sooner success will be yours. Anything that is sifted is broken…even people. God desires it. (Psalm 34:18) In fact, those who are in the midst of this process are closer to the Lord than one may realize. God is drawn to your insufficiency and weakness. It makes room for His Spirit. Feeling sifted today? Let go for help is on the way! If you can relate to being sifted today, read Psalm 51. It is all about the process of consecration. God desires to make you complete and whole. He longs to lift you above this world and reside with you in His Presence. But there are some things that may hinder your arrival. He will remove them. Those things which bind you to earth once removed will allow you to rise above! What are you waiting for? Submit to God’s process of removal and renewal for your life. Allow Jesus to activate your potential and reveal your purpose by letting go. His Promise is nothing less than spectacular! Submit to sifting!